Current transformer of power system plays an important role in providing a current in its secondary winding proportional to the alternating current flowing in its primary. They are commonly used in metering and protective relaying in the power plants and substations where they facilitate the safe measurement of large currents, often in the presence of high voltages. The current transformer safely isolates measurement and control circuitry from the high voltages typically present on the circuit being measured. 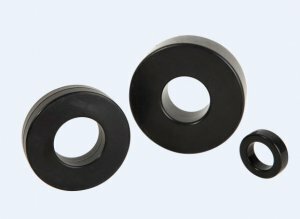 Comparing with the traditional core material, such as silicon steel and permalloy, Iron based nanocrystalline alloy takes the advantage of high permeability and low cost, and is thus more competitive in the application of precise current transformer with 0.2, 0.2s, and 0.1 accuracy class, Bushing current transformer for Epoxy resin cast, Gas insulated or oil-immersed switchgears, LV, MV and HV switchgear, and other apparatus in electric power transmission and distribution system. Note: Cores of other specifications are available upon request.